It’s been four months since I first stepped foot in Washington D.C. to embark on my summer internship with the Congressional Sportsmen’s Foundation (CSF), and my time here has been nothing short of eye opening. I’ve learned numerous lessons over the course of the summer, but there is one that stands tall above the rest: You are only as strong as the individuals around you and the partnerships you create. This simple and borderline cliché truth has never been so apparent to me until working for CSF. I discovered a diverse community of conservation champions comprised of legislators, bureaucrats, private enterprise, and NGOs that creates a rich and complex network which has been decades in the making. It is upon these partnerships that conservation victories rely, and never have they been so important than right now. The political climate is tumultuous and budgets are tight, both representing barriers to those with the mission to expand the sportsmen’s heritage and conserve our nation’s public trust resources. With the media attention focused primarily on government inefficiencies, political polarization, and disproportionate special interest group influence on politics and policy making, it is hard to see the mechanisms, tools and processes in place that set the stage for the ground conservation achievements. One such tool is the Federal Advisory Council (FAC). FACs were authorized by the Federal Advisory Committee Act of 1972, resulting in the creation of the Wildlife and Hunting Heritage and Conservation Council (WHHCC) and the Sport Fishing and Boating Partnership Council (SFBPC) among others. CSF is the only organization represented on both Councils, whose members are appointed by the Secretary of the Interior and represent a spectrum of outside groups concerned with hunting, fishing, boating, and conservation, who provide policy advice to the various DOI divisions, epitomizing the concept of inclusion and collaboration in the decision making process. I had the privilege of participating in this process when a colleague and I were tasked with drafting comments on Recommendation 17 of the US Fish and Wildlife Service’s (USFWS) vision document titled, Conserving the Future: Wildlife Refuges and the Next Generation. Recommendation 17 is specific to hunting and fishing on wildlife refuges and was therefore important for the WHHCC to weigh in on the current language of the guiding principles and objectives of it. My colleague and I proceeded to scour associated documents and email conversations from Council members and agency staff, and meticulously combed through the recommendation’s language, crafting changes along the way, being cognizant to keeping what we thought were the best interests of the sportsmen’s community in mind. Our comments were presented to both Councils and after a few small additions were unanimously approved without edits and sent on to USFWS. It was a gratifying moment and a highlight of my time here. Fast forward a week; I attended the Field & Stream Heroes of Conservation Awards Gala at the Ronald Reagan International Trade Building in Downtown D.C. The ceremony is conducted to recognize conservation leaders from around the country for their efforts in conserving and restoring fish and wildlife habitat at the local scale so it can be enjoyed by future generations. Over the course of the night I watched six different conservation heroes receive gratitude and applause from a room of 200 or so members of the conservation community, all indebted to their on-the-ground service and action. Listening to them speak about their projects, thanking the people, companies, organizations, and agencies that made the success of their pursuits possible, affirmed the importance of conservation partnerships and made me even more aware of this extensive network working together for a common cause. The final gentleman to take the stage was 78-year-old Gene Wright from Burley, Idaho. 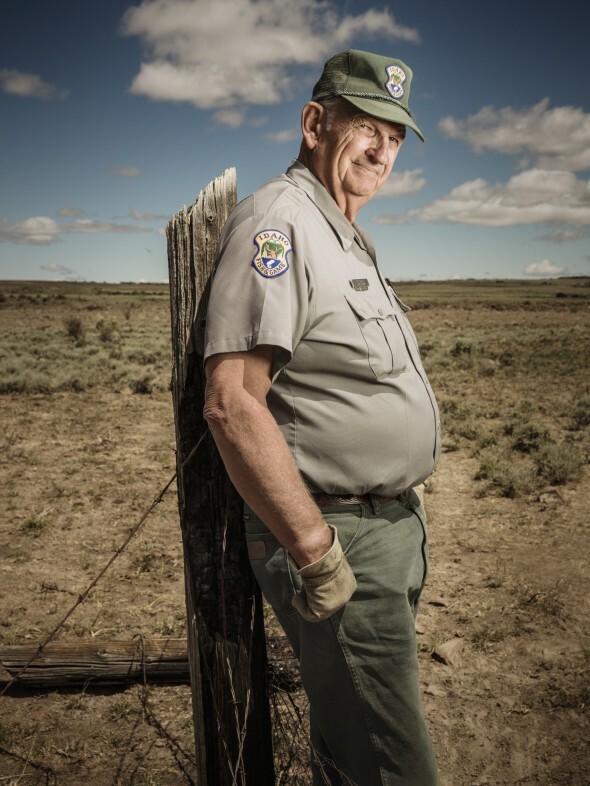 I watched as his eyes filled with tears as he recounted stories of his time stocking pheasants, planting brush, aging harvested mule deer, performing creel surveys and conducting fishing clinics as a fish and game volunteer reservist program participant. His wife Etta sat next to me looking on at her husband with a level of pride that is difficult to describe. It was at this moment it struck me that the data Gene had been collecting for the past 22 years as a volunteer and the programs he was a part of are necessitated by strategic plans and agency vision documents much like the one I had just played a small role helping shape. I quickly realized that I was part of something much bigger than I originally imagined. The above anecdote is but one of many instances this summer that I was reminded that it is a plurality of actors investing their effort at many levels, and when linked and aggregated translates into conservation successes. Partnerships formed and strengthened over time across levels of government, the political aisle, agencies, states, industry, NGOs, and communities is what allows the sportsmen’s heritage to persist, and it will be the nurturing and growth of these partnerships that will allow the heritage to thrive into the future.